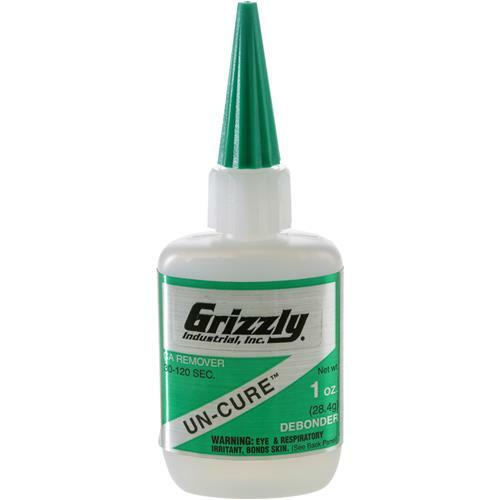 Grizzly H0929 - Un-Cure™ De-Bonder, 1 oz. Due to DOT shipping restrictions this item cannot ship via air services, or to addresses outside the Continental United States.If parts are bonded incorrectly or your fingers are all stuck together, a few drops of Un-Cure will dissolve CA in about a minute. Because of CA's fast working time, it's always a good idea to have a bottle or two of Un-Cure handy just in case. If parts are bonded incorrectly or your fingers are all stuck together, a few drops of Un-Cure will dissolve CA in about a minute. Because of CA's fast working time, it's always a good idea to have a bottle or two of Un-Cure handy just in case.